"$5 11-incher" just doesn't have the same ring to it. WASHINGTON – “$5 11-incher” just doesn’t have the same ring to it. The New York Post reports that its recent survey of Subway Footlong sandwiches served in Manhattan, Brooklyn and Queens showed more than half measured less than 12 inches. 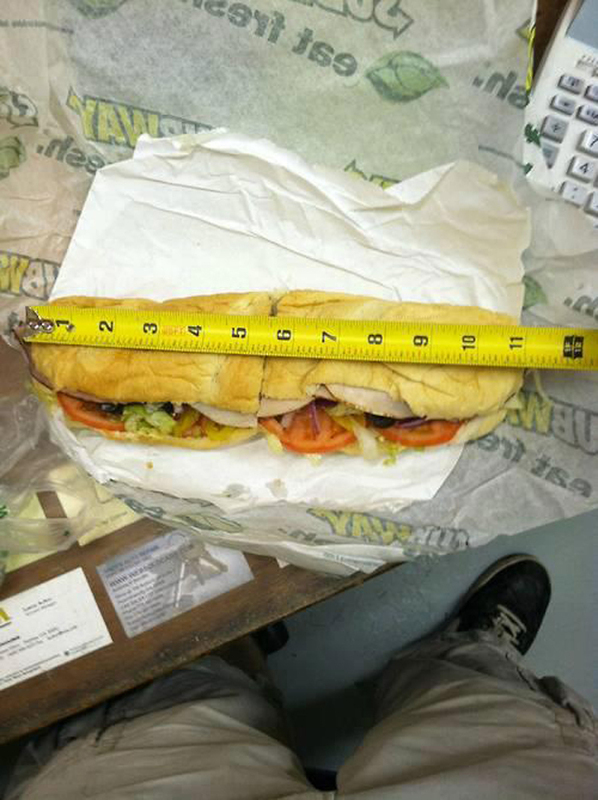 In fact, four out of seven sandwiches measured in at only 11 or 11.5 inches, the Post says. The paper said its survey followed an Australian’s Facebook photo of a Subway Footlong underneath a tape measure that showed the sandwich only came in at 11 inches. The teen tagged the photo to Subway’s page and said, “Subway, plse respond,” The Australian reports. In a reply to the teen, The Australian reports Subway said the photo showed bread not baked to the company’s standards.